Welcome to our March Blog Hop featuring artwork created using the So Much Happy collection. To purchase any of the items seen in our blog hop today, contact your local consultant to place an order. If you have just hopped onto my blog, you can start here as this is a circular hop,and I'm the first stop when hopping from the East Coast to the West Coast. If you came from Kristine's Blog then you are in the right place! For my project I was inspired by a layout from the Idea Book on page 47. I used the puffy stickers, washi tape and compliments as well as many cut apart images from the paper collection. No stamping required. Thanks for hopping along with us - we hope we were able to inspire you to get creative using some of the designs, products and techniques seen along the way. We hope you will join us again next month when we will be featuring artwork using April's collection, Feels Like Home. So mark April 10th on your calendar, you won't want to miss more fabulous artwork. 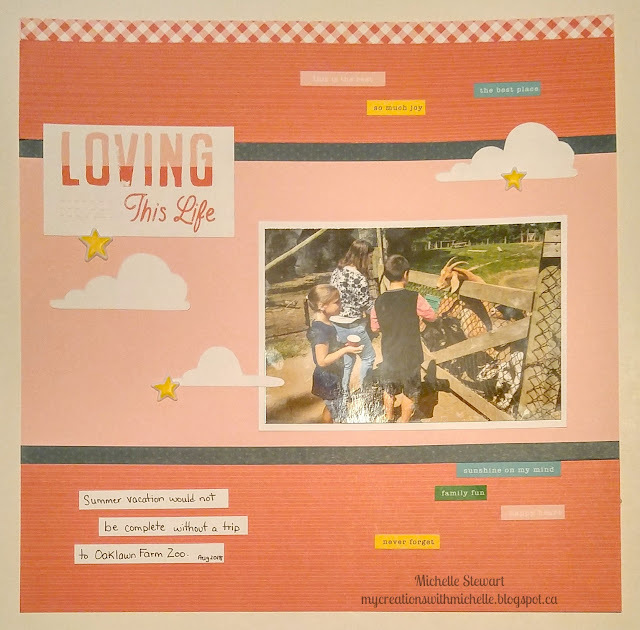 Great layout ~ Going to the Zoo is always a great memory! I love the colors in this layout! I love your layout, super cute!